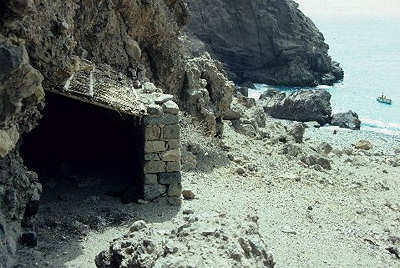 Hermit's House, Brava Island, Cape Verde Republic Drake paused here for water on his Atlantic crossing during the world voyage. He found a hermit's house with an altar of stones outside. On Drake's route, at the most suitable anchorage on the SE shore, 12 miles from the nearest settlement, I found these remains.